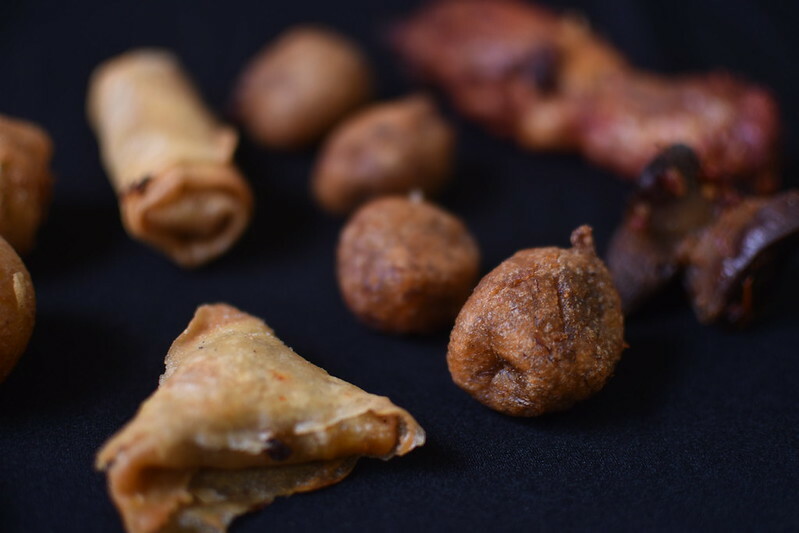 Small Chops Popularity Contest: Puff Puff Wins! Puff Puff. Bouncing up and down like I’m on a trampoline. You’ve spoken. And the winner is Puff Puff. For emphasis and for good reason. 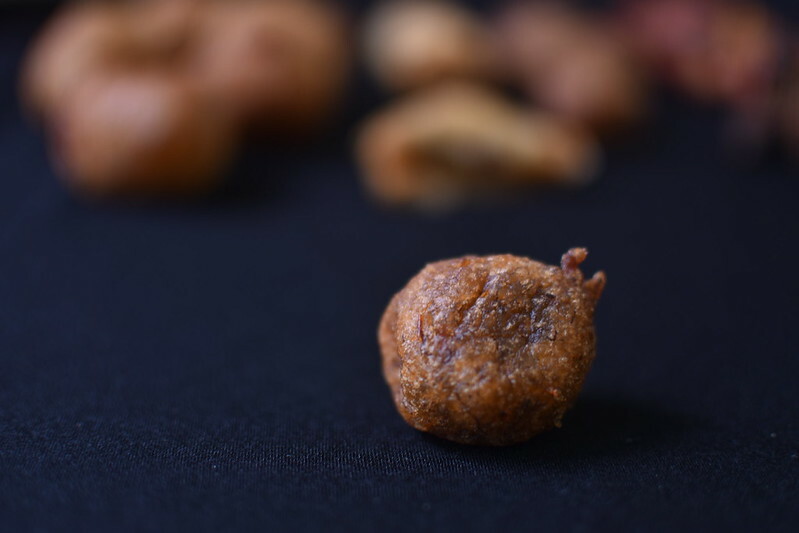 Puff puff has emerged as the most popular item in any pack of small chops. Proof that deep-fried dough balls are the ‘ish. Combine that with spice and/or smoke and it’s apparent why the third and fourth most popular items are gizzard and chicken, quite often barbecued. 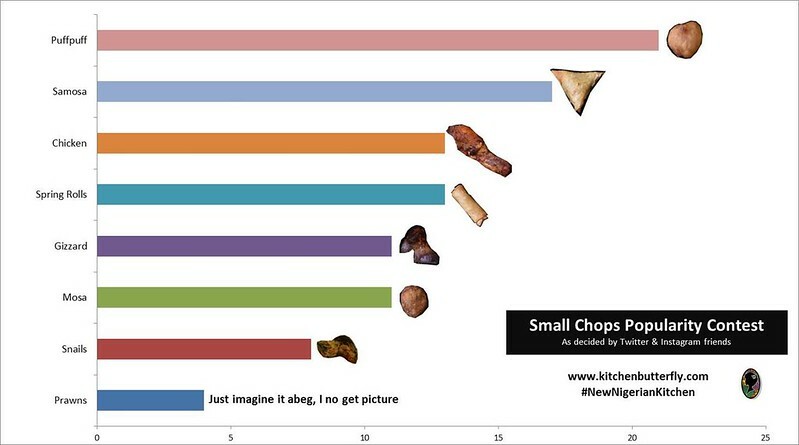 The results of this survey come from a little social media experiment – to find out which small chops items were highly favoured and which ones weren’t. Interestingly, in The Definitive Ranking of Nigerian Small Chops, Eat.Drink.Lagos, Puff Puff is at #3. What’s great about these independent yet complementary studies is that there is some alignment about what really should be in the upper echelons of the hall of small chops fame. We’re in agreement – even if numbers vary. PuffPuff, Samosa, Chicken and Spring Rolls. As defined by my poll. Samosa, Spring Roll, PuffPuff and Asun. By Eat.Drink.Lagos. Three out of four is pretty damn good me thinks. So now that we agree Puff Puff deserves first place, what’s next? Samosa. The combination of meaty filling and crisp, deep-fried pastry is obviously endearing. And then chicken. Because, I believe that most people – like I do – eat them like some kinda small chop sandwich, kinda I said. I mean, I’ll take a bite of puff puff then chomp on some chicken and mouth-make my sandwich. Sorry it isn’t very pretty to think about but it’s the yummiest combo. Ever. I think Gizzard makes a perfect companion too but….Then Spring rolls ties with chicen. Some people mentioned snails but I know some forbid it. This might be a reflection of that but again, sample size so small :). Now, all the responses were great, save for the vitriol directed at Mosa. And I support it all. I’m thinking why not add some chewiness to the whole over-ripe plantain abi banana game with yeast…instead you make a chewy dough and then fry it laidat? Mba, I’m not impressed. But don’t take my word for it. Of responses received on Instagram and Twitter, the results suggest – and I’ll have to take them as being representative of the whole that Mosa was disliked by many. The only other item that got a no was one person’s lack of rating for Puff Puff. No Mossa [sic] for me pls. Can we retire the Mosa while we’re at it? We need to reject Mosa first. That’s where the revolt must begin! So yeah, that’s mostly it – Puff Puff is da winner. The end.